¡¡¡Stop Blaming Columbus!!! is an opera, a work of fiction that attempts to tell truths without being a history, or a sociological study. Some of the characters are modeled on real people; others are imagined personages. In both cases, they are people as they may have been, or might be. By the same token, some of the events are related to real events; the aim of our work of art, however, is not to report incidents, but to relate a story in such a way that the essence of life comes through. Michael Rodemer’s multifaceted education, acquired in the United States, Germany, and France, encompasses degrees in German, English, Comparative Literature, and Sculpture. This dual interest in the written word and in the “word-become-material” has continued to inform his work. Following graduate studies in sculpture, Rodemer returned to Europe, where he completed a series of commissioned neon sculptures mounted in trees in German cities. While teaching as a Lektor for American Studies at the University of Tübingen, he began developing artworks that combined technology, sculptural media and literary elements. On the strength of this work, he was invited to join the faculty of the Art and Technology Dept. of the School of the Art Institute of Chicago, where he remained for three years before accepting a position at the University of Michigan School of Art and Design. 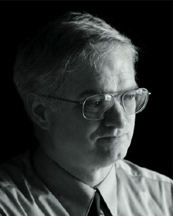 Rodemer spent the 1999-2000 academic year in Berlin as a Fulbright Senior Scholar. During that time, he taught at two German art academies and wrote his first opera libretto, vidGod. Rodemer’s art-making encompasses collaborations in the performing arts and individual work on kinetic and interactive sculptures. 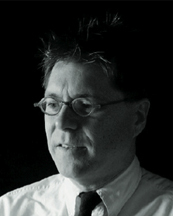 Stephen Rush is the director of the University of Michigan School of Music, Theatre & Dance Digital Music Ensemble (DME). With DME, Rush has premiered works by John Cage, Philip Glass and LaMonte Young, and has recorded with Pauline Oliveros and “Blue” Gene Tyranny. DME is widely known for its site-specific work, “Gypsy Pond Music,” which is performed annually at the University of Michigan and elsewhere. Rush’s extensive body of work includes three operas, chamber music (some of which is standard repertory), orchestra work and over 100 scores for dancers. His compositions have been recorded by the Warsaw and Detroit Symphonies and members of the New York Philharmonic, and performed worldwide. As a performer, Rush has presented his multi-media work in Japan, Europe (including Paris, Berlin and Budapest), Latin America and India. Stephen Rush works frequently as a jazz musician, having performed with Roscoe Mitchell, Steve Swell, Eugene Chadbourne, the late Peter Kowald, and his own NY-based trio “Yuganaut” with Tom Abbs and Geoff Mann. Rush is an Associate Professor at the University of Michigan, where he has taught for 18 years. He earned a doctorate at the Eastman School of Music, studying with third-stream pioneer Gunther Schuller, Samuel Adler and others. ¡¡¡Stop Blaming Columbus!!! is available for purchase from the iTunes Music Store. Audio and video previews of all selections are also available in the BlockM Records catalog.